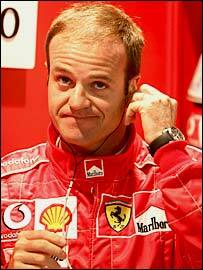 Rubens Barrichello will leave Ferrari at the end of the Formula One season, the Italian team have announced. Barrichello's place as number two driver to Michael Schumacher will be taken by fellow Brazilian Felipe Massa, the 24-year-old currently with Sauber. Ferrari have taken up a renewable option on Massa, who tested for the team in 2003, that dates back to 2001. Reports suggest Barrichello, who asked to be released from his contract a year early, has signed a deal with BAR. The Brazilian was contracted to the Italian team, who he helped win five consecutive constructors' championships after joining them in 2000, until the end of the 2006 season. The 33-year-old won nine races for the team. But he is believed to be unhappy with his continued status as number two to Schumacher, a position that has seen him forced to give up a number of race wins even though the German generally had the upper hand on him. The 33-year-old is expected to sign for BAR-Honda, either as a replacement or team-mate for Jenson Button. Button is hoping to stay on at BAR after changing his mind about a return to Williams. The Englishman is attempting to free himself from a contract with Williams for next season, and if he succeeds it is thought Barrichello would replace Takuma Sato and become Button's team-mate. Barrichello, who famously slowed down during the Austrian Grand Prix in 2002 to allow Schumacher to pass and win, has voiced his anger at incidents with his team-mate at Monaco and Indianapolis this year. "Michael and I have had two, three or four situations of this kind," said Barrichello. "I have always had to think in two ways: to think of what I should do for him and what I should do for the team. "In future I will consider him not as a team-mate but a driver like any other." Massa, who made his F1 debut in 2002 with Sauber and returned there in 2004 after a year testing with Ferrari, has long been linked with a permament move to the Maranello-based outfit. But many question whether he is worthy of the drive. He is managed by Nicolas Todt, the son of Ferrari boss Jean Todt. "I feel ready for this new challenge, which is the best opportunity of my career," he said. "I am aware of the responsibility it places on me and I cannot wait to be part of a team like Ferrari, alongside the best driver in the world, Michael Schumacher. "I am very happy and proud to be racing with Ferrari in 2006."